Chinese state media has praised India’s decision to refuse to patrol the South China Sea with the US. “This may be true. Yet, the fundamental reason is that New Delhi understands the significance of a sound China-India relationship to the nation’s development. India cannot afford to lose China’s support, which serves as an economic engine for the nation’s growth,” an editorial said. A Reuters report in February had claimed the United States and India had held talks about joint naval patrols in the South China Sea. Indian Ministry of External Affairs said later the Reuters report was false. “We have denied it. There are no joint patrols,” said Anil Wadhwa, secretary (East) at India’s Ministry of External Affairs at the start of the Delhi Dialogue VIII forum on 17 February. The Global Times post also slammed the US for “following a ‘divide and rule’ policy”. “In addition, New Delhi has officially taken over the presidency of the BRICS (Brazil, Russia, India, China and South Africa) from Moscow last month and will host the eighth summit within a few months. A friendly atmosphere is significant for the upcoming summit,” it added. Global Times, a newspaper owned by China’s Communist Party, is known for its strident editorials. “By refusing the US proposal, India is taking a stand and showing goodwill to China” the mouth piece of the ruling Communist Party said. Editorials of state-owned media in China, like Global Times, generally reflects the Communist Party viewpoint. The editorial argued that “the White House is just manoeuvring India for its own interests” and that the US is “wary of India’s rise”. “From US perspective, China, Russia and India are all threatening its status as a superpower. The US does not want to see a stronger India,” it said. Official relations between the world’s two fastest growing economies have come a long way since the two fought a brief border war in 1962. In a bid to ensure peace and tranquillity on the border, Chinese and Indian border troops have conducted a joint disaster relief exercise last month. China and India agreed to begin military exchanges and establish a hotline linking army commanders on either side of their disputed border last year. Indian Prime Minister Narendra Modi and Chinese Premier Li Keqiang agreed at a meeting in May to start annual visits between their militaries, expand exchanges between border commanders and start using a military hotline. Indian Finance Minister Arun Jaitley has also lauded the burgeoning trade and investment ties between India and China. “China had been a significant contributor to the global growth in the past decade,” the Indian Finance Minister said last year. The BRICS Development Bank, the Asian Infrastructure Investment Bank (AIIB) and the Silk Road Fund are all initiatives spearheaded by China for a new kind of global development financing. 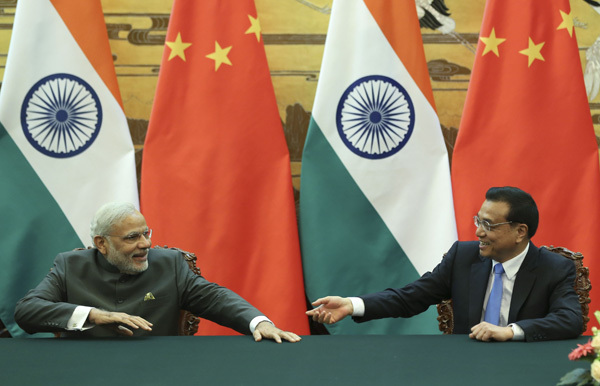 India has partnered with China on both the BRICS Bank and the AIIB. New Delhi will avoid SCS until and unless China don’t cross the red line.If China in future tries to move its Nuclear Submarine and ships in IOR then don’t be surprised then in future Indian Nuclear submarine and warships patrol the South China sea and mind it India is commissioning its nuclear armed SSBN next month and 2nd one may be launched this year for sea trial.China has more to loose than India so onus is on China not India to improve its relations with India and address its genuine concerns. Btw SCS doesn’t belongs to China but other SCS littoral states as well.Beijing should avoid any confrontation with India in high sea as China is inexperienced in naval warfare. India is focus in developing its economy. US has never been friendly to country potential will overtake them, specially India and China. Let US focus on China and Russia, keep India out of it. India will be opened to US and Europe weapons, 5 to 10 years from now, India will have better arsenal than US. US was never interested in India before recent years development, BRICS was formed before India turned the corner, China is India key trading partners. Indian are friendly not stupid. Chinese military warships, submarine etc. will continue its excise in Indian Ocean where it is international water. India has to claim to the world that Indian Ocean belong to India, then Chinese military will not be in the India’s water. South China Sea as you said, it belong to littoral countries, it has nothing to do with India. China has claimed it over hundred years ago, you may disagree, that’s why there is a dispute. There is no dispute for Indian Ocean where is an international water. Hope you present a logic argument. History tends to repeat itself. Hegemonic powers do not want to give up their # 1 position in the world economically and militarily. U.S may have a national GDP ( nominal) of over 18 trillion but it’s debt is well over 20 trillion. A liability of 2 trillion. The collapse of mighty Empires, if US continues this trend, they will be no different than past empires, USSR is one good example. Overstretching raw military power and not emphasizing on their own internal affairs is a recipe for complete civil unrest. In PPP terms China is already # 1 of over 20 trillion, India 7 Trillion in PPP terms. While both China and India’s is 1/3 of the world’s population, the average income is roughly 8 thousand a year in U.S dollars in China and India. The average American makes 50 grand annually. From my reasoning, BRICS nations need to stick together in order to have a world order equilibrium. India is smart not to checkmate China. The western world has no need to get jealous of the eastern world, even when the center of gravity shifts from west to east, living standards in Asia will takes decades to meet living standards in the west. India needs to play wait and watch game till we get enough power may be in next five years and should align with US as long as they stab us using Pakistan .If US changes policy towards Pakistan and we have enough fire power then India will have enough weight to be in super power league to fight or friendship. US can’t expect India to align with them as long as they finance Pakistan arms.